An Smachtlann is one of the oldest houses in Kenmare, built in 1798 and nominated for a national architecture award for its 2013 restoration. Right in the centre of Kenmare, it is perfectly located to enjoy the delights of the town on your doorstep. The house is built on 4 levels. On the top floor there is a double bedroom and a large family bathroom with separate bath and shower. On the next floor down is a large double room and a childrens bedroom with bunk beds and a separate single. On the ground floor there is a kitchen with small dining table and a living room with a fireplace and doors out onto the terrace. On the lower level there is a cinema room with projector and surround sound which also has a large double sofa bed and can be made into a private bedroom if needed. There is also a large shower room. On this lower level is the dining room extension which has large glass sliding doors which lead directly into the shared yard. This level also has a laundry room. The cinema room and the lower level near to the dining space both have woodburning stoves and the polished concrete floor of the dining room is underfloor heated. Because we joined the small cottage next door onto the main house we have gained lots of circulation space which means that even on a rainy day you won't feel cramped! I'm a busy mum of 3 small children, living in London but with a piece of my heart in Kenmare. My husband's parents are Irish and we have lots of family friends around the area so when this old lady of a house came along in 2013 I fell in love. I've restored 3 old houses so far and am currently doing a 4th in Portugal. I used to be a project manager but since the kids came along I've found that restoring very old houses has become my passion. This is by far the oldest at over 200 years old. When we bought this house it was in danger of falling down if it wasn't restored quite quickly. It is one of the oldest houses in Kenmare and had been owned by the same man since 1950 and hadn't really been touched since then. It has a preservation order on it which meant we had to employ a conservation architect to design and then manage the build. We've used lime plaster everywhere, restored the original doors and staircases, had replica Georgian sash windows made. The front wall had to be tied to the back wall with steel, a whole new roof was put on using old slate from a local church being reroofed. It has been a labour of love. But now it is a really useable space and we love being here with friends and family. There is loads of social space so even if the weather is bad we don't feel cooped up. And I love being right in the middle of town so popping out for a coffee or a quick walk to the pier is really easy. No need to jump in the car. I think this is the only house of this age in Kenmare which you can rent. It is a piece of Kenmare history and was commended for a national architecture award after our renovation. It is a wonderful, comfortable, sociable space. The family bathroom is on the top floor and has a separate bath and shower. The bath is extra long for a good soak! The shower room is on the lower ground floor next to the cinema room. The heating is run on bottled gas - it is super expensive to run and rather than add in extra costs we hope that guests use it sparingly and recognise that extra jumpers are sometimes needed! For bookings of more than one week we will provide clean linens and can arrange for a clean mid stay. We have WIFI - not the speediest in the world, but standard issue for Kerry! There are lots of towels in the house - please use the purple ones for the beach! There is sometimes a problem with one of the rings on the hob as all of the gas is from bottles so we occasionally have pressure issues! But there are 6 burners so you should be fine! Electric fan and smaller electric conventional oven. We will leave some milk in the fridge and some bread and butter. Please help yourself to any food in the cupboards. All the equipment you will need! The kitchen has all the equipment you should need and we also leave all the basics in the cupboards for guests to use. The eat in table in the kitchen easily seats 6 and the large table downstairs seats 10. We have a highchair and also booster seats available. Sonos system for those with sonos app. CD player too. We absolutely loved our stay in Kenmare, and this place was a big reason for it. Kristin and Julia were excellent to work with and very responsive. Julia was waiting for us upon arrival and gave us a nice tour of the property. Its location is perfect ... just a few blocks from the shops and restaurants. There were even electrical adapters in every room for us. We wish we would have stayed more than one night here as it was one of the nicest places we stayed. Gorgeous, comfortable and welcoming home in perfect location! My family and I rented An Smachtlann for my wedding weekend in Kenmare, and it was a fantastic experience from beginning to end! We booked several months in advance, and were in regular contact with the owner Kristin and the housekeeper Julia who answered all of our questions and made us feel right at home. They ensured we had everything we needed – both in the lead-up to our visit and while we were there. An Smachtlann is an absolutely gorgeous home, and much larger and airier than it might appear from the outside. There is tons of natural light in the kitchen, bedrooms and living areas, and the beds are oh so comfy! I slept in the one on the top floor, which was just lovely to wake up in – tons of light flowing in, and I had an amazing view of the whole town. Julia went above and beyond and made sure the kitchen was stocked with necessities like tea, bread, milk and all kinds of other things – and there were even fresh flowers in vases around the house! I would highly recommend this place to families or groups seeking a gorgeous accommodation with character and comfort. Thank you so much for everything, Kristin and Julia! 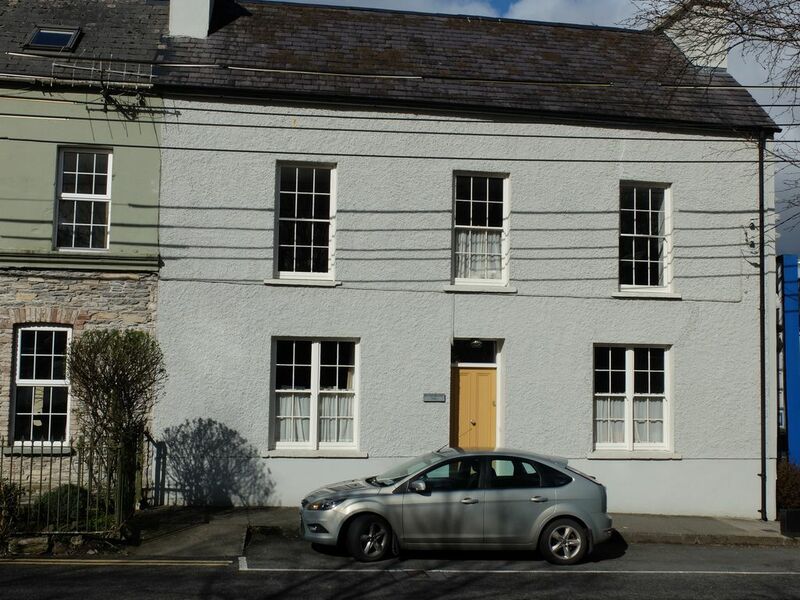 This was a wonderful and roomy home in the quiet area of the village of Kenmare. My family of four spent several lovely nights at this home. The housekeeper Julia, met us and let us in. She walked me through everything I needed to know about the home and was very helpful and kind. It is conveniently located to downtown shops/restaurants and yet is on a quiet street. There is so much room in this house and it really has everything you could need including an indoor ping pong table. I'm not sure if it's in the description or not, but it might not be the best choice home for seniors as it's four stories of stairs. I have no complaints, it was perfect for us! This is a truly exceptional home. Beautifully renovated yet very comfortable, it made our stay in Kerry very special. Plenty of room for our two teenage boys to spread out, comfortable beds, a well equipped kitchen and a ping-pong table - all in walking distance to great restaurants, pubs and shops. Julia is a gem, and do pop in to the Cleo shop next door. Perfect location, exceptional house with all you could possibly need. We look forward to our return! Perfect location, exceptional house with everything you could possibly need. Great for families. Lots to do in the area, with top class restaurants on your doorstep. We willing definitely be back! Right in the centre of town with bike hire and great walks close by. The house is perfect; beautiful, relaxed and easy to use. The young adults loved the proximity to pubs and the cinema room, while we loved all the restaurants and the walking. With whale watching in Baltimore a scenic hour and a half drive away, the ring of Kerry on your doorstep and the wild Beara peninsula across the water too much to do and see in one week. A warm welcome from Julia made it just perfect. Thank you. We are right in the hub of the town and there are activities for every age group. On wet days we have an indoor cinema to pass the time and a table tennis table.